Beauty maven Sara Schieff-Ross, owner of Archbeauty Skin Care Salon & Boutique, has been voted by DAYSPA magazine as America’s “Top Entrepreneur” of 2012. 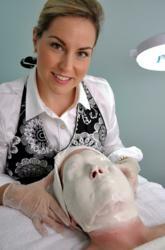 Sara has been in the beauty industry for nearly 20 years; she began as a teenage makeup consultant at Filenes, continued on as a successful esthetician and has built, managed and operated spas on the east and west coasts. She has become not just a popular business owner, but also a well-known industry expert in Southern New England. The media has sought her beauty and skincare advice, featuring her tips in publications like Newport Wedding Magazine, Newport Mercury Magazine and on FOX Providence’s The Rhode Show.